Ryan Harpur fired a hat-trick for Dungannon Swifts as they inflicted a fifth straight defeat on Ballymena United with a 4-2 success at the Showgrounds. The midfielder scored twice early in the second half after United had battled back from 2-0 down to level at half-time in a frenetic encounter at the Showgrounds. The result takes Dungannon above United in the table and leaves the Sky Blues just two points above Ballinamallard United in 10th place in the Danske Bank Premiership table. United boss Glenn Ferguson had been due to take charge of the Sky Blues for the 200th time but the manager missed the milestone occasion through illness. Goalkeeper Dwayne Nelson was recalled to the starting line-up after regular stopper Alan Blayney failed to overcome a back injury, while Johnny Taylor returned to the centre of defence in place of Kyle McVey. David Cushley and Willie Faulkner also claimed places in United’s starting XI at the expense of Gavin Taggart and Leroy Millar. But when play began, it started disastrously for Ballymena as they conceded a goal inside the opening 15 minutes. Andrew Mitchell collected the ball from a throw-in and barged his way into the penalty are before laying the ball back to Douglas Wilson’s whose low shot was deflected back into Mitchell’s path and he fired home from close range, despite Nelson getting a hand to the ball. Worse was to follow for the home side as Dungannon doubled their lead from a hotly disputed penalty on 15 minutes. It came after Mitchell’s hooked shot towards goal came off the underside of the bar and as Ryan Harpur steered his follow-up effort wide, he was challenged by Nelson. The referee’s assistant flagged for a penalty and Harpur tucked the resultant spot kick into the corner past Nelson. Ballymena responded with a well-worked goal on 27 minutes. Gary Thompson started the move by playing a one-two with Eoin Kane on the edge of the Dungannon area. The midfielder continued his run and cut the ball back for Cushley to sweep his 15th goal of the season past Andy Coleman. Ballymena continued to battle their way back into the game with Tony Kane flashing a 25-yard shot not far wide before the Sky Blues levelled a minute before the break. 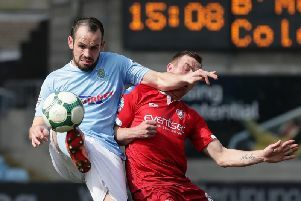 Allan Jenkins latched onto a clever through ball by Eoin Kane and rounded Coleman before steering home the loose ball. The second half started in whirlwind fashion with both sides having chances inside the opening minute. First, Jonny Frazer flicked David Cushley’s cross over the bar from close range before Andrew Mitchell burst through the middle but as he attempted to round Nelson, the Ballymena keeper was able to stick out a hand and divert the ball to safety. But Dungannon went back on front on 54 minutes when Harpur ran onto a pass and cleverly dinked the ball past the advancing Nelson. And the midfielder completed his hat-trick four minutes later when he collected a free kick played into his feet and his clever turn bought him a yard of space to steer a shot past Nelson. Dungannon came close to a fifth goal when Cormac Burke’s pass released Ally Teggart but after the former United player rounded Nelson, he could only find the side netting with his weaker right foot. Ballymena United: Nelson, T Kane, Taylor (sub Taggart 82), Ervin, McBride, E Kane (sub Tipton 66), Thompson, Frazer, Faulkner, Cushley, Jenkins. Subs (not used): Henderson, McVey, Smith. Dungannon Swifts: Coleman, Hegarty, Armstrong, Montgomnery, O’Rourke, Fitzpatrick (sub Lowe 56), Wilson (sub Hazley 52), Harpur, Burke, Teggart, Mitchell (sub Liggett 75). Subs (not used): Burns, Addis.